Emily Ashkin: My name is Emily Ashkin. I am 18 years old, and I am a freshman at Rice University. I grew up in Charlotte, North Carolina. ThinkSTEAM: Briefly describe your research topic. Emily Ashkin: Melanoma is a deadly form of skin cancer. One promising treatment approach involves stimulating the body’s immune system to fight the cancer. This is known as immunotherapy. This process involves specialized cells known as killer T cells. Think of these as drones programmed to seek out and destroy a target, which in this case are the cancer cells. Unfortunately, they often fail at their mission because cancer cells can disguise themselves. So, how do we unmask cancer? I discovered how to make cancer cells more recognizable to killer T cells. I succeeded in finding a chemotherapy drug capable of unmasking cancer cells. With the results from my study, we are now better able to harness the power of the immune system for combatting melanoma. ThinkSTEAM: What inspired your research in skin cancer? Emily Ashkin: My fight against cancer began when I was eleven. That was when my mom was diagnosed with skin cancer. Her diagnosis sparked both indignation and compulsion. My research career had begun. Naturally, I turned to the Internet and began researching articles about cancer. I devoted countless hours to studying the disease that claims more than 7 million deaths a year. At first, the articles were dauntingly complex, but as I persisted, the language of science and research began to make sense. I began to grasp the meaning of cancer. I came across some strikingly elegant articles that kept my eyes glued to the page. However, I knew that I needed to do more than just be informed. Despite just being 14 years old, I had an epiphany that I could start doing cancer research in a lab. I reached a point where I couldn’t just sit and watch my mom suffer anymore. My natural proactive instincts prompted me to reach out to professors and scientists in my area. Maybe I was too young to recognize the audacity of asking to work in a cancer lab, but I persisted. Amazingly, one lab took me in, and, now, I am gaining the tools to battle cancer. Emily Ashkin: Like every scientist, I have faced the inevitable obstacle of making mistakes when conducting an experiment. In that moment of discovery, when it’s just you and that key experimental result, you realize that you’re seeing something important that no one has ever seen before. That’s a truly awesome moment—the best moment in science. All great science is about trying to do something for the first time. Little by little, we make steady progress towards unlocking the mysteries of the universe. However, for every day that we make progress, we endure weeks or even years of the failure. I am a scientist. I understand how to persevere when the answer always seems one step away. I’ve learned that every failure is just another stepping-stone toward the final success. ThinkSTEAM: Tell us your experience in finding a mentor for your project. 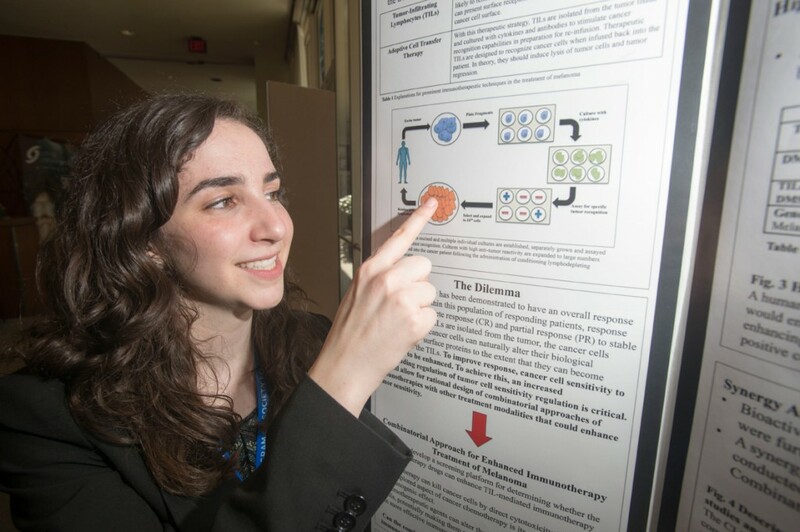 Emily Ashkin: By the time I turned 14, I realized that I wanted to make a difference by doing my own research. I was so naïve. I didn’t see why I couldn’t start immediately, but I really didn’t know where to begin. Neither of my parents are scientists—how was I going to gain access to a research lab? Looking back, maybe a high school biology class would have been helpful. But I persisted and reached out to roughly thirty different local professors and scientists who studied cancer. Most conversations and email exchanges included the same question: “How young are you?” followed, soon thereafter, by a polite rejection. I’m grateful that I was too young and naïve to appreciate the audacity of asking to work in their labs. Eventually, one professor at University of North Carolina at Charlotte gave me my big break. He never told me why he let me into his lab. Of course I was the youngest in the lab and did not get paid. There were some senior year college students who did not acknowledge my presence. I was assigned to shadow a PhD candidate. Fortunately, he realized that I wanted to do more than just read about cancer and watch him work. So, he let me put on the latex gloves and perform such menial tasks as restocking pipet tips and cleaning dishes. But, at the same time, he really took the time to listen to my ideas and spark scientific discussions. This was where my curiosity and longing to understand cancer transformed into my ability to design experiments to fight cancer. I was limited to using whatever supplies were leftover in the lab from others’ experiments. I was able to carry out a meaningful project during the two and a half months I spent there. That summer launched my research career. I spent the next two summers working in different labs on increasingly more sophisticated projects. From there, I started working at the renowned MD Anderson Cancer Center under the direction of Dr. Patrick Hwu and Dr. Jodi McKenzie. ThinkSTEAM: How was it like to do research at the MD Anderson Cancer Center? Emily Ashkin: The Houston heat melted away all presumptions I had about my role as a scientist. In Charlotte, I had become accustomed to my colleagues having no expectations from me because of my age. I was the “little high school student” given the freedom to explore whatever I desired and receive any assistance with ease. However, at MD Anderson, I quickly realized that I had entered an environment where doctors and professors expected a lot from me. In fact, they relied on me. There’s a subtle beauty to working in the lab acknowledging that there is an urgent need for your work to be able to help the patient in the room right next door. I plan to continue working on my current research project this summer and throughout my college years. The findings from this project are going to be tested in clinical trials in the next few years. This will hopefully lead to improved treatment for Melanoma. ThinkSTEAM: Are you continuing your research on the same topic in college? Emily Ashkin: Yes, I am continuing to work with post-doctoral fellows on the same topic and in the same lab throughout my college career. ThinkSTEAM: Tell us about your experience of being a 2015 Coke Scholar. Emily Ashkin: Being a Coke scholar changed the way I look at the future of our generation. I spent Coca-Cola Scholar’s weekend perpetually inspired by those around me. I made some of my best friends that weekend, and it is so incredible to watch them all grow as we are still transitioning into college. Coca-Cola created a family—one I am unconditionally grateful to be a part of. Having been involved in science fair and creating other families from science competitions, I thought Coca-Cola was going to be a similar environment. However, the diversity of perspectives and stories brought to Atlanta during Coca-Cola Scholars’ Weekend goes unmatched. I spend everyday living by the morals and ideas that I learned that weekend. ThinkSTEAM: What is your advice to high-schoolers who are pursuing STEM research? 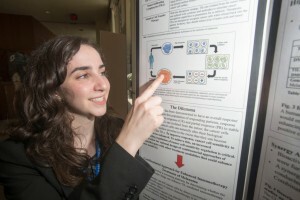 Emily Ashkin: My advice to high-schoolers pursuing STEM research is to not hold back. If there is a field that you want to pursue or a project that you want to do, go for it. Age is no limitation, and if you persevere, you really have nothing to lose. If anything, you’ll discover your passion like I did.